The Arendole estate is located in region of Latgale in Preili district at the bank of the river Dubna. A manor house is a listed building. Place of the estate has been mentioned in the old documents already in the 16th century and its name probably came from the its first owner Arent von Dalen. At the end of 18th century Arendole estate was owned by Duke Sieberg and in the beginning of 19th century it became a property of Duke Mihail Plater. After that the age of Plater-Sieberg family began. What is significant that in the 1861 in Arendole manor Duke Stanislav Plater-Sieberg prepared a document of liberation of serfs in Latgalian language. 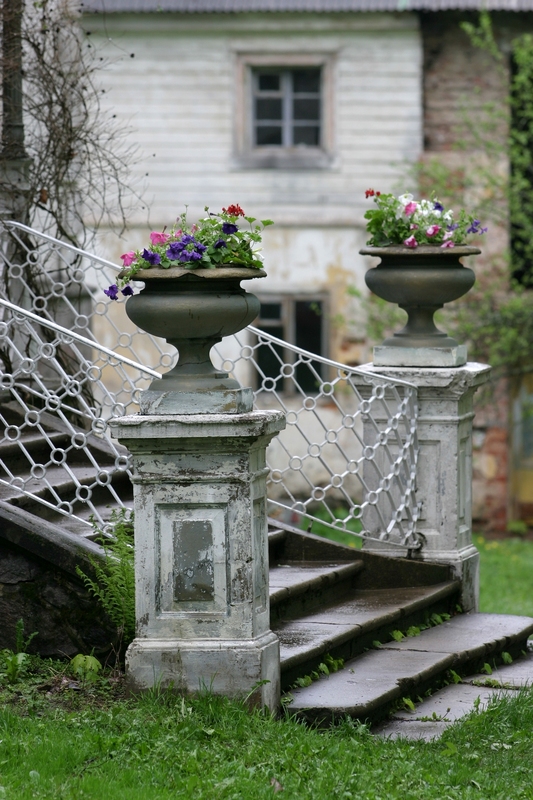 The Arendole estate and its mansion are unique in Latgale because of their ornate and unique nature. The mansion, which is at the centre of the estate, has two long wings which create a straight angle. The long facades are successfully decorated with attics, terraces, an eight-cornered tower with its pyramidal top, an outer staircase with graceful railings, and with vases atop the pedestals that are at the top of the stairs. One of the pediments has been turned into something of a “summer bungalow”. It is made pf decorative wood structures. The mansions cannot be attributed to any single style. It was originally a hunting castle and built for leisure to run festivities and events. Its owners have changed from time to time, and any additions to the building that are seen today were built in accordance with the tastes of those who owned the mansion. Today the appearance of the mansion is one which was created in the early 20th century, when the period of Eclectism was coming to an end and the estate was owned by Duke Plater-Sieberg. The layout of premises in the mansion-house is very comfortable. Several halls and saloons are connected with each other from where guests can go out on the porch of the inner yard overlooking the river. Until 1977, the mansion was an elementary school, after which it was abandoned for quite some time. In 2001, the estate was bought by Arvīds Turlajs and his wife Faimja Turlaja, and they began renovations. In 2002, they registered the building as a museum with the Latvian association of Castles and Manors. With enthusiasm, belief in their abilities, an understanding of the need to preserve the cultural heritage, a comprehension of their financial abilities, a great deal of relentless and patience, and the knowledge that the process must be slow and not hurried one, the couple revealed the initial interior of the building, renewed its original floor plan, and installed stoves for heat, including two tiled stoves from the 19th century. The building now has a salon, a duke’s office, and an exhibition focusing on the building’s history and the Latvian freedom battles of the early 20th century. Arendole estate is surrounded by country meadows, river bank and hundreds years old historical park. Park is slowly recovering thanks to our sheep who has been working on it so we can walk and see through some places. The Arendole estate and its new owners represent deep piety towards the cultural heritage, revealing the unique challenge of understanding that economic and bureaucratic obstacles can be overcome so that the cultural heritage can be preserved without any major commercialisation. See more photos of restoration process here and here (Instagram).